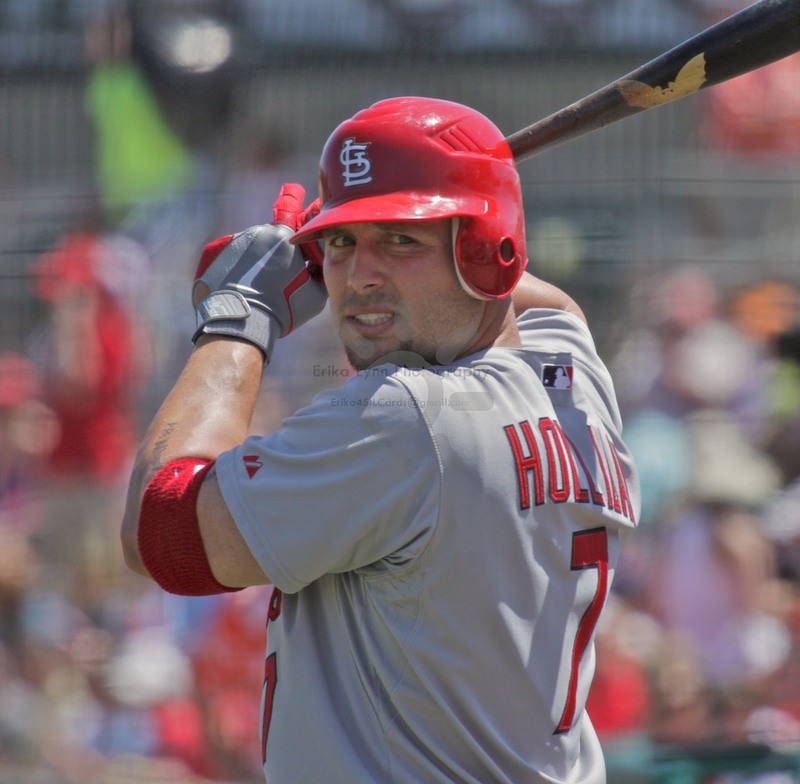 Matt Holliday: Beast or Bust? The United Cardinal Bloggers Fall Roundtable discussions have been going on now since November 1st and are finishing up soon. Great questions, superb insight, fun & informative reads. You can review all the previous topics HERE. Today was my turn to start the conversation. 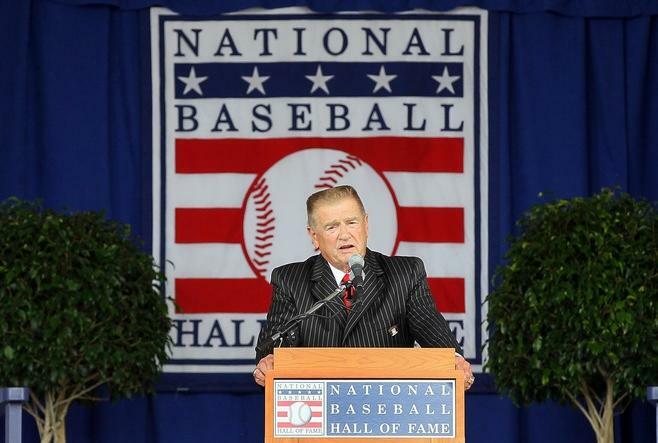 “…before all this fun comes to an end, I’d like to turn our attentions back to one of my favorite subjects: Brendan Ryan. Okay, okay…. I had to try. Come back. 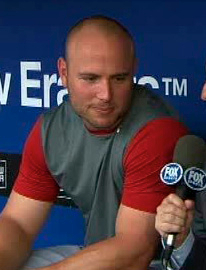 Let’s talk about hunky Matt Holliday. 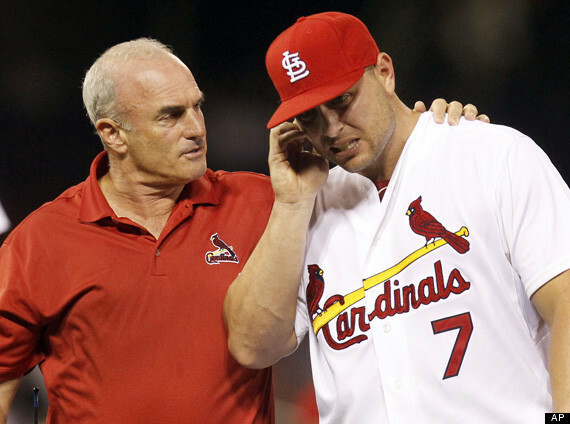 How do you feel about Holliday’s 2011 season? Are his contributions (to date) worthy of the biggest contract in franchise history? 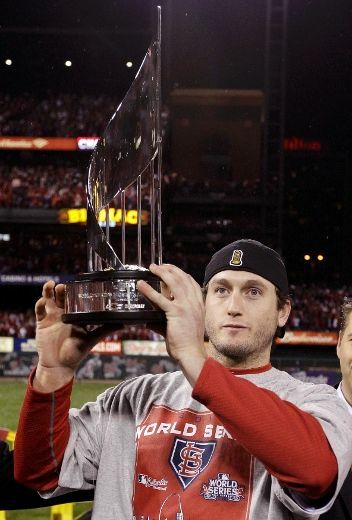 Will Holliday be the producer in 2012 who helps us overcome the lack of #5? Is he worthy of potentially becoming the new superstar face of the franchise? That is a big question mark, isn’t it? spot in the last few years. jilted lover that just doesn’t want to date, it may take some time. 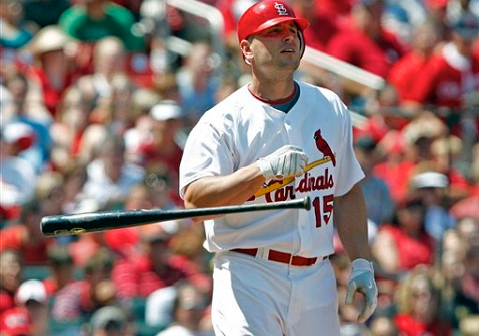 To the subject of Matt Holliday, he was not a bust. In no way was he a bust. How many baseball players start the season with their appendix bursting? Get a moth trapped in their ear? Not to mention the other injuries that I can’t recall. His 2012 numbers, I feel, will be on par with that of 2010. This was the first season since his rookie year of 2004 that he hit under .300. I think he’ll come back better than ever and put up an MVP caliber year and be sent to another All Star Game. Now as far as he being hunky, methink not. 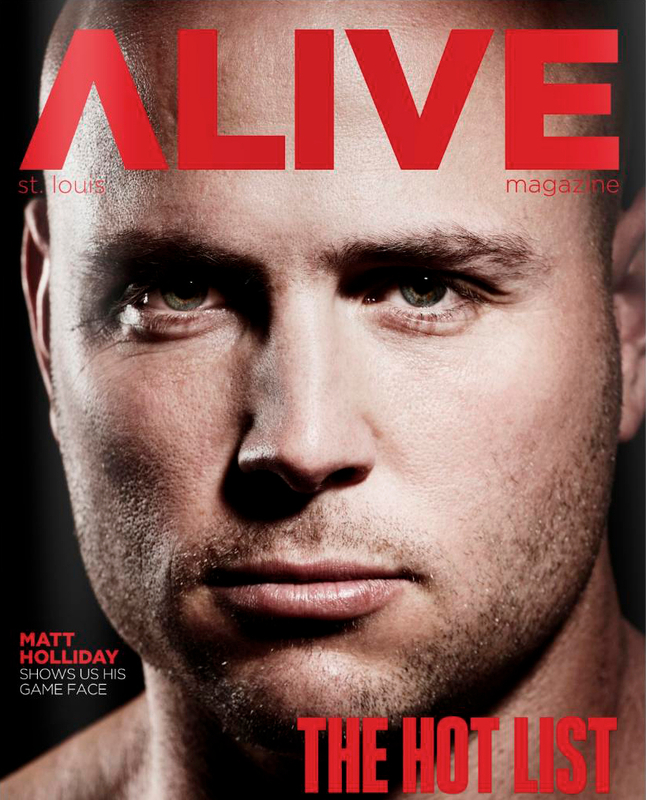 Did hunky Matt Holliday have a bad 2011? Sure, he had a WEIRD 2011, but his season-ending numbers were all pretty typical: average around .300, homers between 20-30, and slugging around .500. His RBI’s were down a bit, but that could’ve been due to the Pujols/Berkman factor in the lineup. Let’s be honest, though – Holliday isn’t going to “make up for the loss of Pujols.” He’s going to give you another robotic year of similar production barring injury. And that’s what he’s being paid to do. 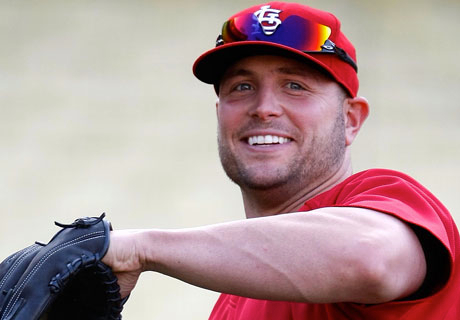 If anything, I’d like to see Holliday be more of a leader on this team. His performance during the Series was an awful example of tail-between-the-legs surrender that we can’t afford this season. So far, Holliday has seemed aloof and distant (much like Pujols). I’m hoping Holliday steps it up emotionally with the departure of Pujols. can’t really be avoided. And only Matt knows if his back injury that nagged him a lot of the late season could have been avoided. on the team all season). appearances since he started playing everyday back in 2006. Colorado, so I am not worried about him going overboard in his approach. was 5 years ago for a team gambling with house money. for my feelings in 2012? scared. For Erika’s sake, I hope he comes out strong. You don’t replace Albert Pujols, no matter who you are. That said, Matt Holliday has a chance — and the potential — to carry much of the load. Others have already quoted his stats, so I won’t repeat them. But, his numbers are enough to conclude that his year of freak incidents isn’t the norm. The only problem I foresee is that, as the potential “face of the franchise,” he’ll put that pressure on himself and struggle. We saw that with Pujols all the time — when he started to play like it was all up to him, he struggled (usually pretty badly). I hope none of the guys are told/feel that pressure of being the ONE to step into Albert’s role. Just one more thing on his leadership. He’s a quiet kind of guy. You listen to him talk or give interviews, it can feel like he’s distant. However, I tend to build my thoughts of players’ personalities and their “clubhouse dynamic” by what other players say about the guy. Listen to David Freese tall about Matt, and you’ll get a pretty solid idea of their bond and the understated leadership style Holliday displays. Plus, keep in mind, he wasn’t supposed to lead this team to victory. Albert was. Now that AP isn’t there, I suspect Matt will be able to have a greater impact on the guys around him. he still isn’t an exceptional defender. womb with a bat in their hands. about him, but he has to get it under control. ballplayer who would do anything it took to win…to cross the plate…etc. what the guy dealt with all season. Matt Holliday underperformed in 2011. Injuries played a part but he still was inconsistent and subpar. The season he had in 2010 for the Cardinals established the baseline: 28 home runs, 103 RBI, .312 batting average, .390 on-base percentage and .532 slugging percentage. That’s what I expect from him each of the next 3 or 4 seasons. He’s clearly capable. guarantee, but in home run rate, he was clearly even with his 2010 season. The difference between his 2011 and 2010 batting averages is 7 hits. The difference between his 2011 and 2010 on-base percentage is 1 hit. or 2 doubles, or 4 singles. among qualifiers – both ahead of a new Anaheim Angel. 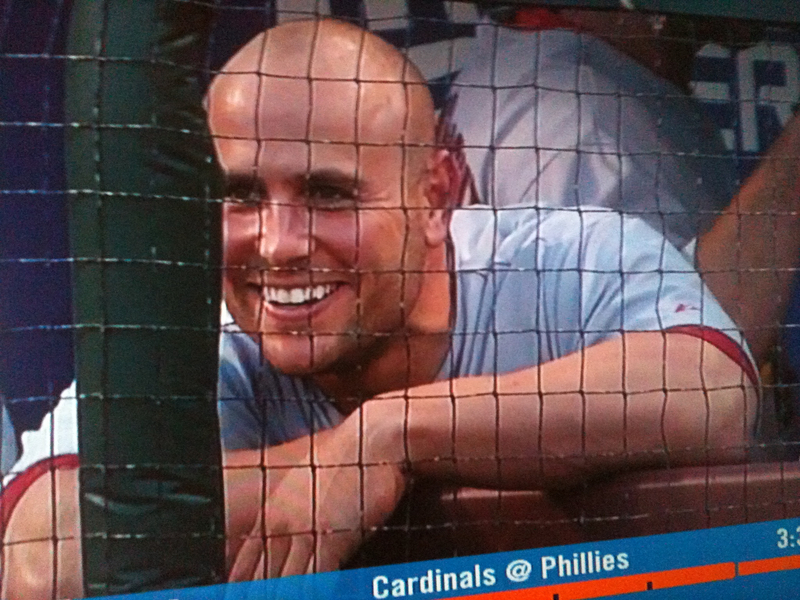 I had a good idea that Erika’s subject would be around hunky Matt Holliday. season was just such a weird campaign for him. Ruptured appendix, moths, sprains, it was so unusual for the durable outfielder. I reference 2010 as a medium of what I consistently expect from Matt Holliday which is pretty damn good. I’m always surprised at the number of people I come across that refer to him as an underperformer. I just don’t get it. As for being the “Face of the Franchise” I’m with Bob in the fact he’s not charismatic enough for said title. Lovable Lance Berkman is a good comp of someone who has the skill set and personality to attain such a title if he was in Matt’s position as far as contract and age. This Albert Pujols wound will need some time to heal before Cardinals fans are ready to crown another “Face of the Franchise” I believe. Or maybe it’ll be J.C. Romero who knows. with that, because who knows how much the nagging injuries hampered him. as he keeps posting numbers in line with his career averages. deal with Pujols to Boston turning Nick Punto into a multi-millionaire. was signed, just continues to become more and more of a bargain. residence, we can expect an OBP near .400 and a SLG a tick over .500.
second on the team in OPS last year–behind Berkman, not #5. Cardinals lineup, I’d have thought you were crazy. 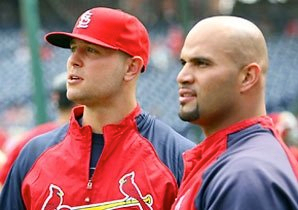 Matt Holliday helped the Cardinals down the stretch to win the division in 2009 and was an integral part of the Championship in 2011. Early in the season im 2011, the Cardinals were much better with him on the field and his several stints on the DL hurt. I think that in 2012 we will see a Holliday that will have a .300+/25-30/90-95 line. I really feel that he is going to step it up next year and have one of the best years he has had in awhile. In 2010 he had 28 homeruns and 103 RBI in 158 games and in 2011 he had 22 HR in only 124 games. Had he had a full season, he may have been able to get 27 HR and 95 RBI. As long as he stays healthy the next few years I think he will be a beast. Not sure the whole charisma thing matters much in regards to “face of the franchise”…Has anyone given less interviews and less intriguing interviews than Pujols? After game 7 of the world series he looked and talked like someone had just shot his dog. Dont buy the charisma argument in regards to face of the franchise. Pujols was the face of the franchise because of his gaudy numbers, unexpected rise to greatness, and potential as the next and last Stan the Man. 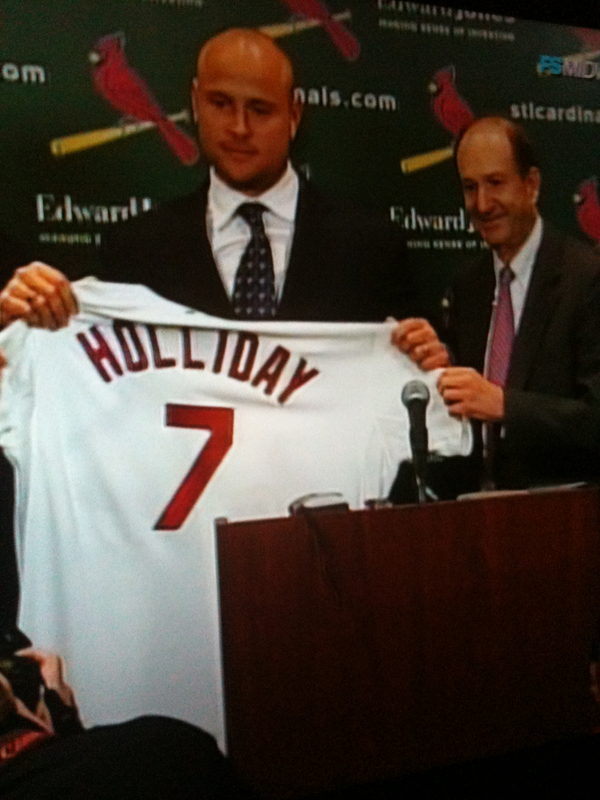 I think Holliday will put up great numbers in 2011. He’s a good enough hitter not to need pujols protection to put up big numbers. Freese and berkman should be plenty of protection. long as he keeps hitting, everyone will be happy. Poor Matt did have a crummy year. All kinds of bad stuff happened to Matt this year. Hopefully, he will rebound next year and have a great 2012 season. The long shadow of Albert will be gone and Matt can shine. He can be a big help to the younger outfielders. last couple of years of his contract. 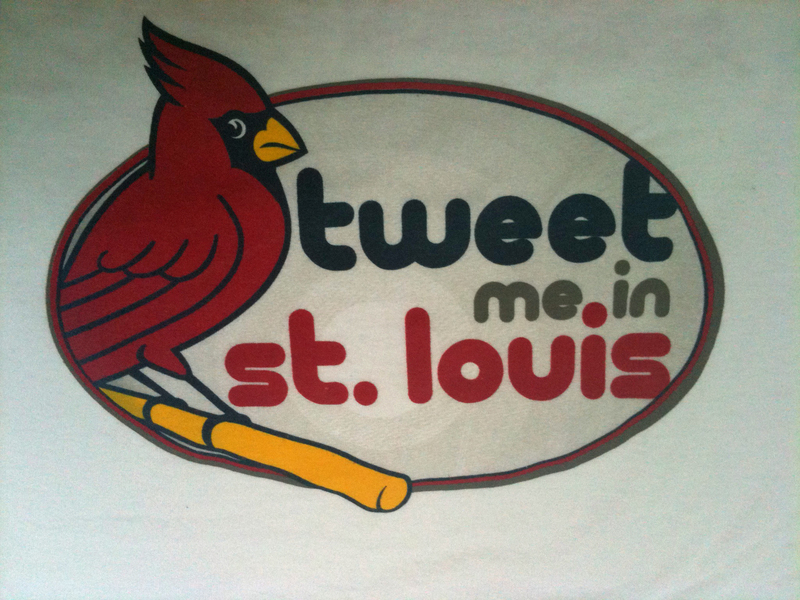 exactly what the Cardinals ask and need him to do. I think Hunky would be pleased. Pujols is gone. We saw magic for 11 years, and now we will find new players to find that spark. Oh ugh. It is way too soon to be sunshine-y about this one. Just shut it. I know. Too soon. Who tries to spin some silver lining when every Cardinal fan everywhere feels like we were just collectively spit on by a man we once compared to “The Man,” a man who we felt could one day be as incredible as Stan… a lifer with the Cardinals. A legend. He won’t be. Not anymore. 1) Mope, whine, and complain. Let everyone vent. 2) Go for the “Okay, what do we do now?” tactic. or 3) Attempt to put a bow on the career he did have here. Stupid. Stupid. Stupid. I tried. I am trying. Earlier in the day yesterday I was able to be more okay with it. I was able to be Erika, if you want to spin it like that. I was okay. Then I read this. Now, if I wrote like Hooks, I would have written a piece closer to the one that Hooks posted yesterday (not suitable for my family – don’t click that mom! :)). Here’s your chance to not talk about the contract, the money, the betrayal (the venom!) that we have seen all over the internets today. Here is your chance to be nostalgic. What is your favorite Pujols memory? The Lidge bomb? The MVP awards? A specific game or meet-and-greet or whatever you choose. What specific memory will you tell your kids and grandkids about when you talk about Albert Pujols. The fact that he’s gone stings, but it doesn’t negate how we felt when he was here. I was not let down. I absolutely understand that many could not bring themselves to answer this one. The state I’m in currently… I’m not sure I could have either. But the news broke while I was at work, and I like my job, so I wasn’t upset about it all really until later in the afternoon/evening. 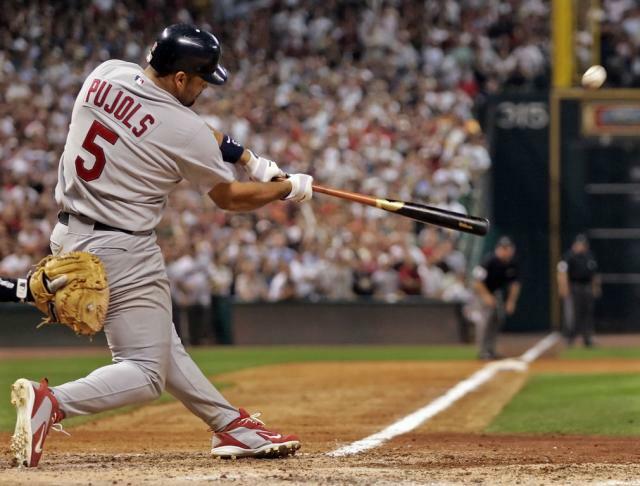 For me, my favorite Pujols memory has to be the Lidge homerun. I was in college, watching the game with 1 Cards fan and approximately 200 Astros fan. Okay, maybe only 15-20 of them. Texas kids all over the place. They were shaking hands, poking fun, having a good time, making World Series plans. Their jaws were on the floor. I was screaming and hugging a girl I barely knew, knowing that not only did the Cardinals have life, the also had the opportunity to go back to Busch II for at least one more game. It was beautiful. But that’s my thought… what did the rest of the UCB think? I’m going to have to go “nostalgic” a few months ago. Three home runs in one World Series game, no matter how far out of reach, was impressive. I seriously do not think anyone in the crowd thought that last at bat would go differently. It was a flash back to the Pujols of old seeing him step in and do exactly what we expected him to do. It was a moment that I will tell my kids about, the way my dad told me that he watched Reggie do it. Like many of us, I was in the first step of denial when I started thinking about 2005 NLCS Game 5. I’m starting to sob as I type this because of all that I associate with that memory. I will be forever grateful for Albert bringing the series game to Busch for one final farewell. Even though we lost, it was one final way to say goodbye. In May 2006, I was at a rare game. Rolen was out with the flu. Pujols was at the hotel with back spasms or something. Jimmy? Well, he had the day off. It was the first time since the MV3 started that none of them were starting. 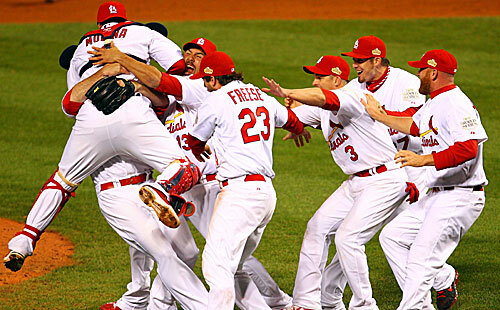 Game 5 stands out as a special memory as does the 3 home run game during this past World Series. I know exactly where I was when it happened. Favorite moment? Wow, that’s tough. Besides the obvious, the Lidge homer, the big game in Texas this year, I think one of my favorite memories is going to be a mid-season game in Colorado. Pujols is on third and a ground ball is hit to the third baseman, I believe. As soon as it was hit, I was sure what was going to happen and, sure enough, Pujols rounded third and came home, scoring the winning run. It was pure Pujols. Doing the little things, the heads-up things, to win a ball game. Something we’ll sorely miss. Too soon, Angela. Too soon. 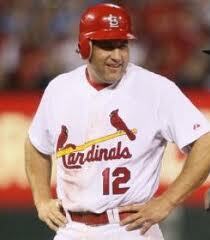 I’m still ready to hammer that backstabbing, St. Louis hating, money chasing, double play machine, former Cardinal. Jesus. Former Cardinal. That sounds so weird. Favorite Pujols Moment? I really did think hard about this. And even though it’s pretty obvious, that HR in 2005 against the Astros was so incredible. Not only was it a go-ahead homerun to put the Cards on top of a game they had no business winning, but it was sooooo top tank. On the road, nevertheless. And it also melted a dominant closer down for years and provided us with the classic Andy Pettite “OH MY GOD” clip from the dugout. I can still watch that specific play 20 times in a row and find something new to love every time. Just wish Gus Johnson could have somehow been on the call. For me, it was a couple years ago…when Albert was on his grand slam tear…a buddy (@dmbfan81 actually) and myself had gone up like a week before my wife was due to have our daughter for two games against the Cubs in Busch. We were in the right field bleachers…Albert hit a grand slam to LF so hard we never saw the ball…just heard the crowd’s reaction and saw Soriano turn and watch it go…and we started screaming and jumping up and down in the bleachers so hard that half our beer ended up all over the other bleacher goers (who were doing the same) and my buddy fell and nearly broke his ankle (swelled up the size of a softball on the way home). Was amazing to actually be present when he hit that. Erika Lynn: You know her! For the glory story, I’m going with being in the stands at Arlington to see Albert hit those three homeruns in Game 3 of the World Series AND at Busch Stadium for Game 7 to witness (what we didn’t know at the time would be) his final at bat as a Cardinal. (Future grandkids may be impressed by that in a few decades.) I have Hubby to thank for those memories. He had to convince me to spend the money, said it was a bucket list kinda thing. I’m so glad he did. It was our chance to witness history. For the personal story: We’ve watched Albert at Spring Training for the past few years and in 2009 I remember being surprised and struck by Albert’s camaraderie with players and staff from the OTHER teams. 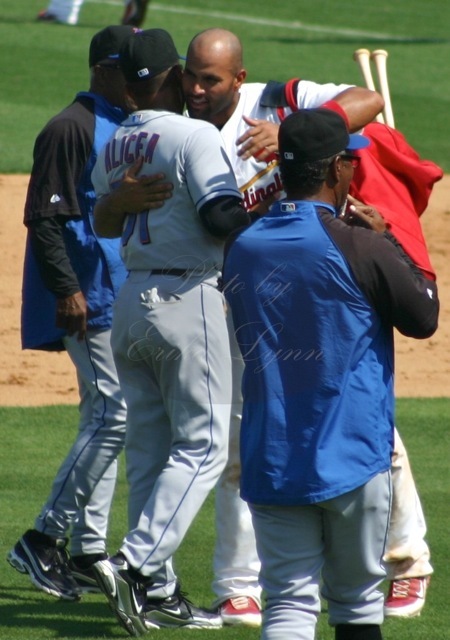 It was one of the final Spring Training games, against the Mets, and both before the game and after, Pujols was greeting the Mets players, coaches and managers like long lost buddies. I was taken aback at first, but then it hit me: Pujols wasn’t just a Cardinal, he was a Major League baseball player and these were his peers. The meaning of baseball family got bigger for me that day. 2001- Vonachen Stadium- Peoria Illinois- Pujols hit his first home run. 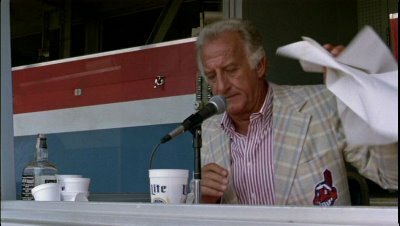 The scorboard flashed Jose Pujols…. he told the local sports guys, “I prefer to be called Albert” ………..from then on, he was Albert. My favorite Pujols memory was Easter Sunday of 2005. Pujols ripped three home runs that gorgeous afternoon while I got completely drunk and screamed my head off with my friends. Afterwards, driving home down highway 55, the wrecked hood of my car flipped up and smashed my windshield. I was forced to drive like Ace Ventura while hoping the police never saw me. They didn’t, which only makes the memory even sweeter. July 20, 2004. The Chicago Cubs put up seven runs against Matt Morris and the Cardinals in the second inning in Wrigley Field. Cal Eldred comes into pick up the pieces. The wind is blowing out, but even the most optimistic Cards fan doubts the team can come back from this one. This isn’t your usual sadsack Cubs squad. This is the team that prompted Sports Illustrated to announce “Hell Freezes Over”, handing the league championship to the Northsiders before the season even began. They’re several games back but the national media wants us to believe they’re just biding their time. Glendon Rusch, the Cubs starter, is having a career year and the Cardinals always seemed to struggle against his wily left-handed ways. It’s almost enough to make you turn off the game. Almost. In the top of the third inning, Pujols turns on a pitch to tack on a run. 7-1 becomes 7-2. Still need to bat around to take the lead. Still looks like a struggle, but at least the team has life. At least you got to see a Pujols home run. It almost looks pointless, as Eldred immediately gives the run back in the bottom of the inning when Aramis Ramirez makes a bad pitch disappear. 8-2. Three more innings pass. Rusch is doing what Rusch did best, changing speeds and making you wonder if Jim Edmonds should start switch-hitting to get a better look. But there’s Albert again. Leads off the sixth inning with a single. Doesn’t seem like much at the time, but it’s the start of something. Rolen and Edmonds follow him up with singles of their own. Rusch is out, replaced by Francis Beltran who treats the strike zone like it has the plague. He can’t touch it. Walk. Bases loaded walk. Single by So Taguchi. Giving up a critical hit to Taguchi is unacceptable. Beltran is out, replaced by old friend Kent Merker to face Ray Lankford. Sacrifice fly. 8-6. The rally Pujols started made it a game, but the good guys were still losing. Pujols smashes another solo home run, second of the day, to lead off the seventh. Cardinals fans everywhere bemoan what Cardinals fans have been bemoaning for eleven years now: why aren’t there hitters with better OBPs in front of Pujols? But it’s a one run game now. Later, So Taguchi’s second most unlikely HR of his career ties the game. The Cardinals have battled back from oblivion. It’s a new start. Bullpen versus bullpen, but who will give? In the ninth, Edgar Renteria leads off the inning with a single against Latroy Hawkins, bringing Pujols to the plate. Do I know what’s going to happen next? Is it that obvious? Is Pujols that amazing? Or do I just dare to hope so much that I convince myself of such a glorious inevitability? the ball jumps off Albert’s bat. It sails through the sky and it doesn’t land until the Cardinals finally have the lead. Third home run of the day. Fifth hit. Fifth RBI. Comeback complete. Even Isringhausen’s bases-loaded tightrope act to get the save in the ninth can’t kill the high. My fondest memory of Pujols wasn’t historic, but personal in a lot of ways. In September of 2009 my wife and I spent our honeymoon in Milwaukee for a three game series against the Brewers. I had never been to a full series before and it was definitely memorable. The Cardinals swept the Brew Crew and Pujols went 7-12 with 3 home runs and 6 RBI. The final game the Cardinals won 5-1 and Pujols hit two homers. We had very good seats for the series (Miller Park is a very good stadium) and it was was great to seem him hit so well and put on a power display. I’m going to have to take the easy route for my memory, and then tell a little story about this year. The Lidge Home Run in the 2005 NLCS stands out for me because I remember all the circumstances surrounding the moment so perfectly. When the game got to the 9th inning and the Cards got a couple outs, my roommate turned the channel to the Rams game (Monday Night Football, if I remember correctly) because the game was “over.” I went downstairs to our other TV and flipped the Cards back on, because I’ve learned time and again never to give up on baseball early. When Eckstein got on with his seeing-eye single, I ran back upstairs and told my roomie “Turn the baseball game back on; they’re not done yet!” He did, and we watched Edmonds also get on in front of Albert. We both scooted to the edge of our seats. And when he connected, we both yelled and jumped high enough to damn near hit our heads on the ceiling. It was such a pure baseball scene: two buddies sitting around watching the ballgame, and it turns into an iconic moment which causes them to act like kids celebrating a little league win. And I will never forget the home run or our reaction. The photo in this post – that’s how I choose to remember Pujols. For all his accomplishments and notable events – that’s what I want to see when I think of Pujols and his time with the Redbirds. "It's a funny game, eh Monty?" A lot of words are flying around about last night’s game with the Marlins. I could pick out a few right now – awkward, rollercoaster-esque (okay, I made that one up), ugly, confusing – but there was one word last night that is just stuck in my mind. Interesting. It was an interesting game. I won’t rehash all of the issues with the Cardinals defense this year. Emily did that quite nicely yesterday. 28 errors in 31 games. I’ve seen better lines on slow pitch softball church league teams… with me in the lineup (all bat, no arm). It’s just… bad. Yadi’s throws were scaring me last night. All the errors are terrible. No error is a good error (unless it is made by the opposition… or the Cubs), but seeing Yadi throw the ball away twice in a game just hit a nerve with me. I was good with Berkman being a less than average defender (and he hasn’t embarrassed himself totally out there). I’ve been able to make peace with second base being sub-par (although I think Dirty Danny D, with consistent playing time, could change that). I’ve forced myself to deal with Theriot at short (but that doesn’t mean I like it). But Yadi throwing balls into the outfield? I can’t handle it. It makes me sick. I take his defense for granted, and dangit, I can’t say that about many players. I need it for someone, and I thought it was him. More interesting, although rather unsurprising, was Carpenter’s start. I’m not going to say that Carpenter is pitching poorly this year, because he’s obviously not. Last night he threw roughly 110 pitches and 67 strikes over six innings. A roughly 60% strike rate? Not great. Fell behind in the count, walked some guys. 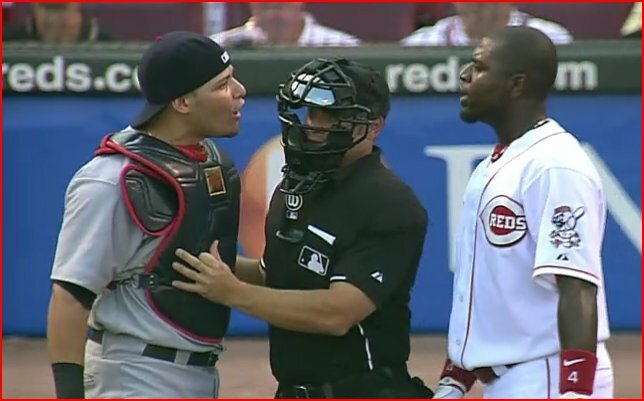 He also fussed at a couple of Marlins after Hanley Ramirez made an interesting slide after he was already out at home, the ump called a close play at first against Carp, and when Ramirez reacted after grounding out and Carp got on him about that. Geeze. I honestly just don’t like seeing his hot-headedness come out like that. Nothing good comes of it. Some players become more effective when angry – the anger propels them to perform at their peak. When Carp gets hot-headed he doesn’t really get good results. 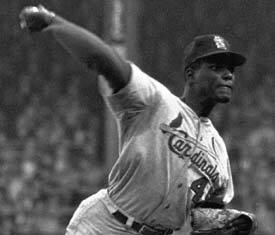 People compare Carp’s intensity to Bob Gibson. I hate that comparison, and that’s not a knock to Carpenter so much as it is a rather severe nod to the excellence of Gibson. Dude tried to pitch on a broken leg. He was accused of being surly, crass, and borderline rude. The words I would use to describe Carp (besides intense, obviously)? Fierce is fair, but after that… crabby. No really. When he does things like that, it seems like a hissy fit from an old man yelling at you to get off his lawn to me. I have no idea where that image of Carp came from, but it’s all I see. Note: Coming up this Saturday is the UCB Progressive Game Blog. It looks like we have drawn the seventh inning, which could mean either we spend our time talking about how great the starting pitching is, how Tony is using the bullpen, hoping the team holds on or cheering for a comeback. Either way, it should definitely be exciting! Head on over to the UCB website to see the entire roster of blogs for the event! Want To Be An On-Site Reporter? Okay, here’s the deal – there are five of us running around here on Diamond Diaries. Five fanatic female Cardinal fans. We love our baseball and we love our boys. When the Cardinals come to us and say, “Hey, we’re having a social media night and you all have two free tickets,” we do a little happy dance. Then we looked at the date. Tuesday, May 17. For the most part we’re all an out of town group, and it’s tough to sneak in to St. Louis on a weeknight (at least during the school year). None of us can use the tickets. Cue the sad trombone. The good news? Our loss is your gain! Bill Ivie will be wandering around with free stuff, but you have to tell him I sent you. You get to touch Matt Sebek’s hair. No really – he said so. Take a couple pictures! We’re jealous that you can be there, and want to see what we’re missing out on. Be willing to write up a few paragraphs on what you experienced. Did you seriously touch Matt Sebek’s hair (and did you take a picture – this really intrigues me)? Did John Mozeliak come out to give a little talk? Say so! Did you get to shake hands with Matthew Leach or Derrick Goold? Tells us about what you talked about with them! Did a foul ball land three rows in front of you? So close! All we ask is that you email us some thoughts and pictures that we can use here on the site. Give me a story. Some story about someone that had an influence on you as a baseball fan. Maybe you got an autograph from a player after a game. Maybe your dad bought you a foam finger and taught you about how to bunt over a pretzel and nachos. Maybe the bullpen guys tossed you a ball during warmups. Maybe you just met a fellow Cardinals fan on vacation somewhere and stopped to chat for a minute about the team. These things interest me. Leave your story in the comments section and check back Monday morning to find out if you won! Good luck! Also, if you missed it last night, Erika, Emily and I were on the UCB Radio Hour with Bill Ivie last night to talk a little baseball with him. Topics included the ever popular #chickcomments, a possible resurgence of the MV3 from 6-7 years ago, and me telling a story about a mean trick I pulled on Erika last summer. Check it out!